A Taste of Key West with Key West Foodies! When planning your vacation, a few crucial questions come to mind: Where are you going to stay? Which sites are worth seeing? And most importantly, where are you going to eat? People are deeming themselves “Foodies” more than ever, leading unique dining experiences to be at the heart of most vacations itineraries. Additionally, many are turning to Instagram to find picture-perfect dishes in the cities they visit, instead of sifting through reviews on travel websites. Lucky for us, Key West Foodies, an up-and-coming Key West-centric food Instagram, gave us an inside look at their social media tips and local foodie know-how to ensure that your stay in Key West is a delicious one! How did you start Key West Foodies, an Instagram about the food in Key West? One day we were trying to decide where to go out to eat when we realized Key West needs a Foodie Instagram! All four of us were discussing how much we eat out in Key West and how difficult it is for not only tourists, but also for locals, to decide on a good place to eat or drink. So many websites, for example Yelp or TripAdvisor, can be so misleading and do not always highlight what we consider to be an exceptional dining experience with the best food Key West has to offer. We believe eating out is not only about the food itself, but also about the entire dining experience! Tell us your Instagram secrets to success: how do you get the perfect food photo for social media? It is quite humorous to witness—It consists of us four girls using multiple phones (and sometimes cameras), some taking the photo with flash, some without, and some with the phone flashlight on for optimal lighting. Then come the live Instagram stories and Boomerangs, which as you can imagine, is even more humorous to witness. What have you discovered about the food of Key West since starting the Instagram? We often get stuck in a routine of where we go to eat, even when there are hundreds of restaurants in Key West to choose from. Starting @KeyWestFoodies has thankfully forced us to switch up restaurants, opening our taste buds to so many delicious new places! Talk a little about what your experience was like at Cero Bodega, The Marker’s poolside spot? It was a delightful surprise that Cero Bodega chose a preset menu of the chef’s favorites! The food was delicious and much more unique than one would anticipate when dining at a hotel restaurant. The atmosphere gracefully converts from a fun, pool-bar, casual atmosphere into more of a finer dining, quiet, and tranquil experience at night. It was very cool to find out that Cero Bodega is local friendly, which we will happily come back to. The spin Cero Bodega took on several of Key West’s famous food items was a fun and refreshing change. For example, Cuban Mix Pork Nachos, which we loved down to the last chip! What are some signature dishes and flavors that you can only find in Key West? Key West is only 90 nautical miles from Cuba, so you can find a Cuban dish served at almost every restaurant! Cuban food is rich in flavor, very savory and always served in large portions. Local favorites include — traditional Cuban sandwiches, paella, oxtail, pulled pork, and palomilla steak with rice, beans and plantains. Don’t forget to grab a cafe con leche or shot of bucci! 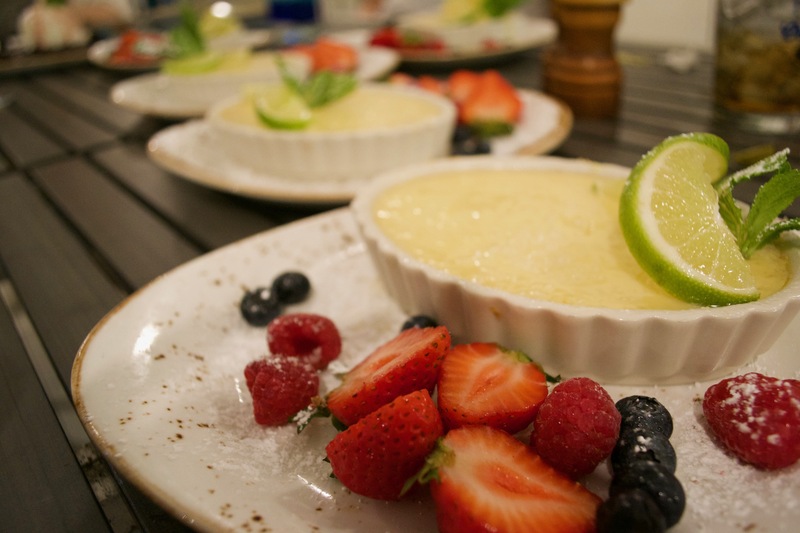 Key Lime Pie is absolutely the most popular dessert in Key West amongst visitors and locals. The use of actual “key lime” makes the pie more tart compared to other key lime pies, you really can’t beat it. We guarantee you won’t find a slice of pie as delicious looking AND tasty as you will at Blue Heaven. Lastly, we love the seafood found on this island that’s right off the boats and straight into the kitchen — conch ceviche, Florida lobster and Key West Pink Shrimp are a must. There’s nothing like FRESH seafood! What is your favorite place to get Cuban Coffee? As long as you're going to an authentic Cuban coffee shop, you can't go wrong in Key West! It's mostly a matter of what's convenient. If you're in the north end of the island, go to El Mocho or Kim's Kuban. If you're downtown, go visit Sandy's Cafe or Five Brothers. Be sure to get a cheese toast too! What is a local favorite restaurant or eatery that you recommend to our guests that come and stay with us? We have so many favorites in Key West, but if we had to choose a place that we know guests will enjoy, Santiago’s Bodega is one of the best restaurants on the island. Santiago’s Bodega is a tapas-style restaurant, also known for their sangria, which is delicious! Be sure to make a reservation because this is a favorite for many locals and tourists and it is very difficult to dine here without a reservation. Some of our favorite dishes are the Saganaki, which is haloumi cheese that they flambé with brandy right at the table, and the beef tenderloin, which is seared and topped with bleu cheese butter. Love the food of Key West? Make sure to follow Key West Foodies on Instagram, and keep an eye out for their meals at The Marker’s Cero Bodega. For a glimpse at our weekly drink specials and poolside food selections, follow along on our Instagram, Twitter, and Facebook!